LAKEVILLE, IN. – Like many sports, a solid defense can make or break a team. This year for the LaVille Girls Soccer team, coach Daniel Pleninger changed the role of Kylee Platz a bit. Last year, Platz played more of an outside defender. This season, Platz was playing right in the middle of the action. 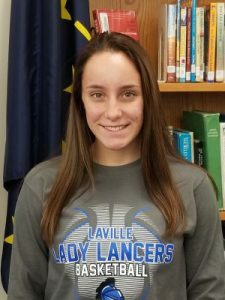 For her effort, www.lavilleathletics.com is recognizing Platz as a team work player. “This year Kylee became a critical piece of our defense,” said Pleninger. “Last year she was an outside defender and did a great job, often times defending the leading scorer for the other team. This year she moved to the center of our defense where the pressure is much higher and where you cannot afford to make many mistakes. Platz was a part of a defensive unit that allowed just two goals a match and had eight shutout victories.